If you like sushi, then you'll probably like these interesting Japanese snacks. I found them to be a little strange at first, but before I knew it, I had the whole plate sitting in front of me as I chomped away at half the batch. If you can get past the slight fishy flavor of the nori sheets, you might just find yourself addicted to these like I was. These are pretty easy to make, although it starts to feel like an arts and crafts project. Whisk together brown rice syrup, sesame oil, and a little cayenne until the consistency is almost slurry-like. "Paint" the mixture on the nori sheets using a pastry brush, and be generous with the syrup amount. I found that the finished strips that had the most syrup ended up masking the fishy flavor, and they almost became like candy. 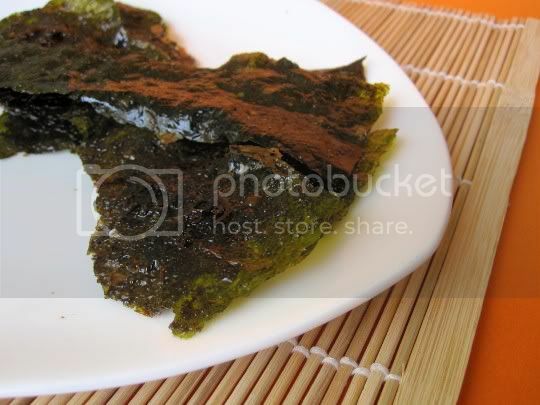 Be careful with the nori sheets, as they are delicate and will tear easily. Once "painted," sprinkle the strips with a little salt, bake for 10 minutes, then cool for 10 minutes...then paint the other sides, and repeat the process. The end product is a smoky, roasted, savory, salty, and caramelized snack. The brown rice syrup provides a hearty and savory sweetness, and the bit of cayenne definitely gives these a bite. I loved the texture of these: crisp, crunchy, thin, light and airy, delicate. Make again? Maybe. I'm not sure the prep work is worth the end result for repeat tries...especially since I know I've seen similar premade nori snacks. But they were definitely interesting and tasty!